This is the post that got me kicked off WordPress for two nights! Of course I removed the offensive link. Have a nice night! Hi Everyone! It’s time for the second installment of WOAW’s Girl Talk (boys welcome, of course). In the first installment of Girl Talk, I shared my makeup tackle box, which is apparently called a “caboodle” in the Cool People Club (of which I am not a member– yet). Tonight, I want to share another favorite girly passion of mine. Bags. 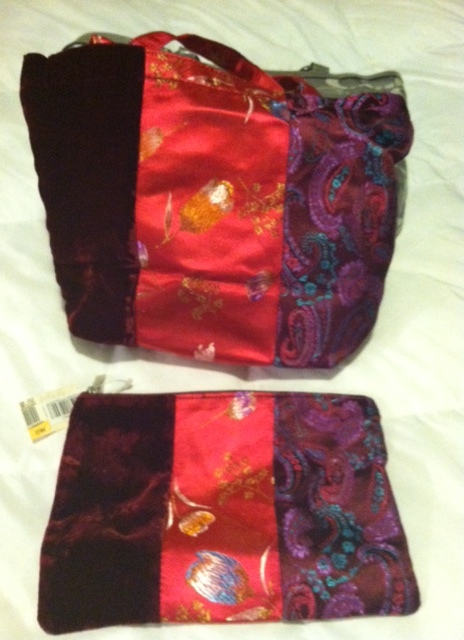 By “bags,” I mean handbags, tote bags, makeup bags– basically, anything that I can stick stuff in to carry it around. I love bags. As a kid, Mom let us pick out a new bookbag every school year. I believe it was the start of third grade when I picked a super rad, plastic, blue see-through bookbag, in the shape of a briefcase. I was so psyched to carry it to school, all my stuff glowing blue through its pockets and panels. How disappointed I was when we had a stupid hurricane that delayed the first day of school! I had to wait a few extra days to show it off. As a serious dance student, I constantly had some sort of “dance bag.” My favorite was a boxy, pink number with a separate compartment for my ballet shoes. As I got older, I used various forms of duffel bags and totes as my dance bags, filled with shoes, dancewear, leg warmers, towels, and all sorts of fun stuff necessary to the dancer’s life. Besides my dance bag, I carried around a big, giant purse (the fad during high school in the 80’s in New Jersey) and then in college, graduated to backpacks and messenger bags to tote around all my crap. Nowadays, I love to buy purses. The odd thing about this fact is that I hardly ever carry a purse. Still, I can’t resist buying them. 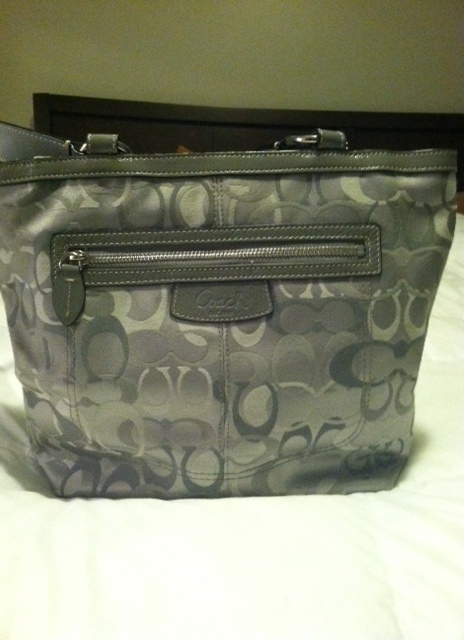 For instance, here’s a purse I bought from the Coach outlet near my house (yes, a Coach outlet near a handbag addict is dangerous– I try to stay away). The day I bought this I decided I couldn’t live without it. I loved it so much. I still do. The first time I used it even my husband noticed (I told him it cost “about eighty dollars,” which isn’t entirely false depending on how you define “about.” I prefer a looser, more fluid definition myself.). 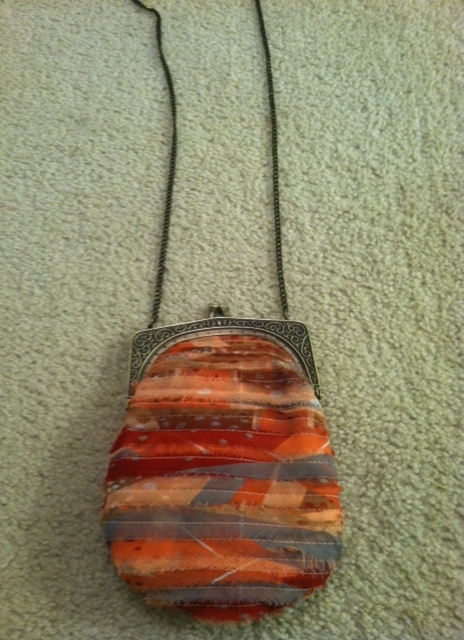 Then there was this adorable bag from Anthropologie. Look at that chain strap and clasp! And the colors and chiffony material! To die for. I couldn’t live without this one either. What about this cute bag? I stole this bag from my mother’s closet. That’s a matching makeup bag! Yep. That’s the paper that came inside the bag at the time of purchase. How cute is that liner though? The adorable Anthro bag has not yet been used. Whenever I think I might use it, it doesn’t match, or it’s just not what I’m feeling that day. Don’t think I don’t love it though. I do. So my question for all of you gals is: What is WRONG with me? I’m not an accessory lover and I don’t even like to shop. Why do I feel the need to buy all these bags? Am I a bag hoarder? Sometimes I purposely keep myself out of the handbag department of stores because I know I won’t be able to resist. Other days I thank god I don’t have money or else I’d be a Designer Handbag Junkie. I see an area full of bags and it’s like some weird, inner demon takes over, whether I’m in Nordstrom or Target. I think I need an exorcism. Then there’s the issue of the work bag. The people I work with who read my blog are probably groaning and rolling their eyes about now, because I talk about this saga constantly. They are sick of hearing Jess’s Work Bag Whine, but I can’t help it. I am very emotional about the entire thing. Here’s the gist. Years ago I purchased enough stuff from Lerner (which I think is now New York & Company) to get a free tote. It was shiny and brown and perfect. It became the Work Bag to End All Work Bags. I loved that tote bag more than any other personal possession. When the straps broke, I stapled them to The Bag, refusing to let The Bag die. Finally, my friend Jamie (who bought me a Burberry diaper bag for my baby shower) argued with me to retire the Lerner bag. I would have ignored her crazy talk if my friend Nicole, an Expert Shopper, didn’t back her up. I think it was sometime in 2004 when I gave that bag up to the Big Bag O’ Lost and Abandoned Totes in the sky. I had a relationship with that bag, people. I was devastated to let it go. Since 2004, I’ve been searching for a replacement. I’ve yet to succeed. 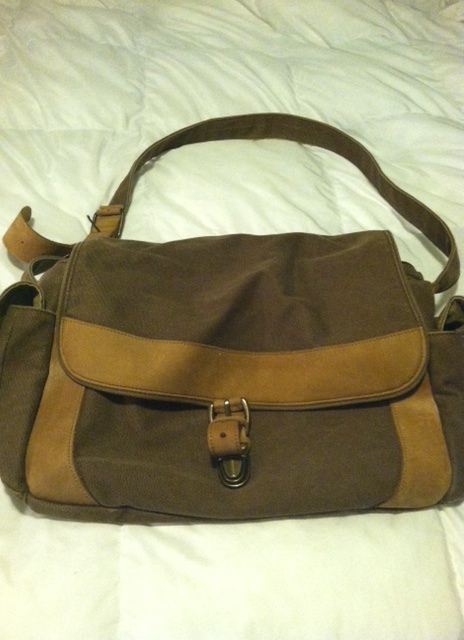 I tried this messenger bag from L.L. Bean . . .
. . . but it was too floppy. And heavy. Nowhere near the Excellence of The Bag I Had Lost. Angela, my friend and co-worker, and sometimes Enabler and/or Fixer, provided me a slew of hand-me-downs. She felt my pain. None of her bags stood the test of time. Currently, I’m using a bag I bought for my mother-in-law for Christmas which I decided to keep for myself (relax– I bought her something else). And of all those handbags I’ve accumulated? I’m using a $12 tiny canvas bag from Target on a day-to-day basis. Although I keep searching and spending money, I don’t know if I will ever find The Perfect Bags. 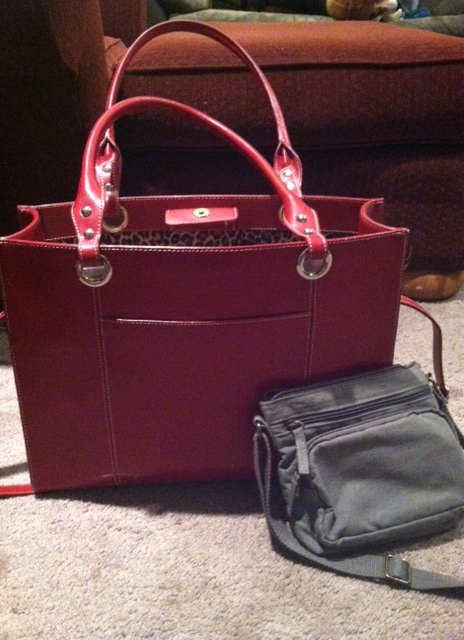 I don’t know if I will ever truly understand my obsession with buying and stockpiling purses. Is it just me or is it universal? Is handbag love engrained in the double X chromosome combo, or a function of estrogen? Help me, Blogtropolis. Help me to understand. Thanks for reading and have a nice night! I agree that it’s hereditary–my mom passed it down to me. I am a semi-recovering bag hoarder. I don’t buy as many as I used to (a lot) and have done many clean outs (resulting I’m sure in some very happy Goodwill shoppers), but I still probably own about 50 bags. So Jess, you are most definitely not alone! 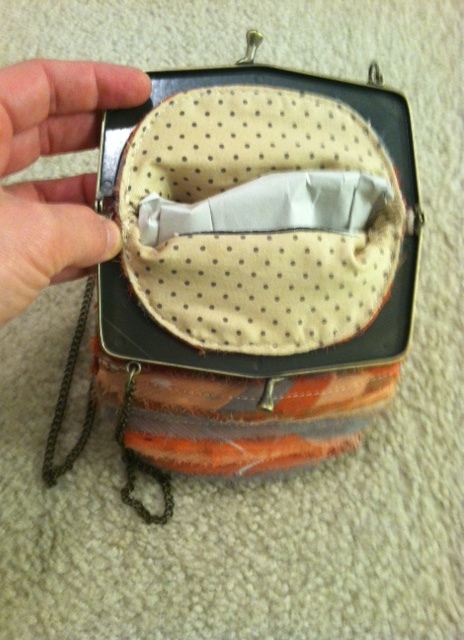 I actually borrow purses from my 10 yr old daughter – because hers are nicer than mine!